With the right conditions, attics can be the ideal environment for mold development. If you are not careful, conditions like excessive heat, high humidity, or roof leaks can prove to be adequate moisture sources for mold growth in your attic. Attics often have poor or insufficient ventilation and various insulation problems. Moisture begins to buildup as a results of the obstructed air flow. The consequence? Mold. If you’ve uncovered mold in your Virginia attic, don’t run for the hills yet. We can help. Mastertech Environmental’s team of expert attic mold inspectors and attic mold removal technicians are carefully trained to properly assess your attic for mold growth and prescribe a safe and effective attic mold removal solution. Once your attic is clean and safe, we’ll make recommendations for preventing mold from returning in the future. Mastertech of Tidewater provides the highest quality attic mold removal services in Virginia. Our top priorities are, and will always be, client safety, quality control and getting the job done right for you and your family. What causes attic mold in Virginia? Aside from the obvious roof leak, moisture buildup in the attic can be inconspicuous and easily overlooked. As hot air rises in your residential or commercial property, it collects in your attic. If an attic is poorly or insufficiently ventilated, it can fall victim to excessive moisture buildup. Warm air in the attic can lead to condensation and elevated humidity. 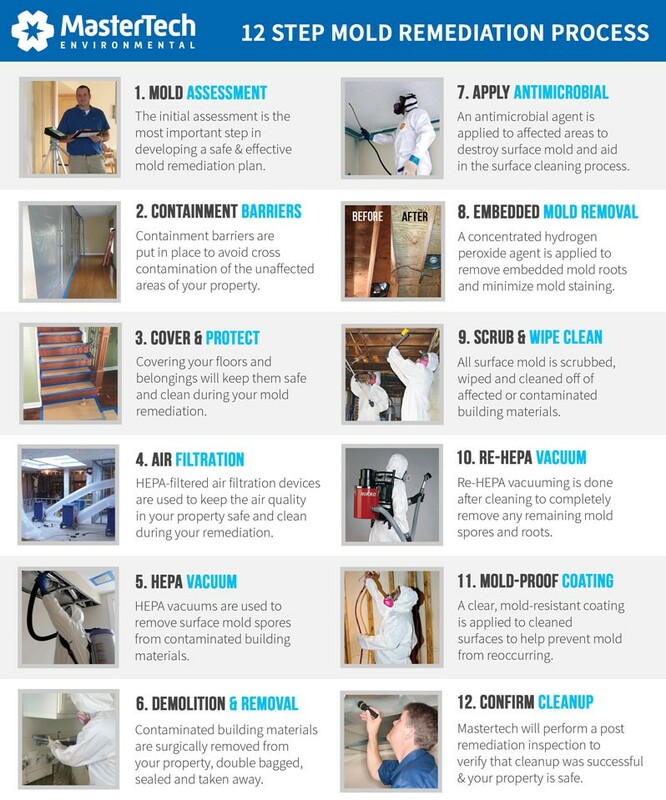 Visual Assessment– During a visual walk-thru, your inspector will look for conditions that could be contributing to mold development. You will have access to all digital documentation from our inspector for your records. Moisture Mapping– Your inspector will carefully map out the damp or wet areas of your attic to determine moisture migration patterns and get to the bottom of where the water starts and stops. This will help us understand the full extent of the problem and what is causing it. Moisture Meters: Your mold inspector will use moisture meters to read the moisture content of your attic building materials. Moisture locked within porous building materials be easily over-looked for an extended period of time. Attic Mold Testing– Surface and/or air quality tests will provide scientific data that will confirm or deny the presence of mold and how much mold is present. If mold is confirmed in your attic, the test results will help your inspector figure out the most appropriate course of action to resolve the mold issue. Report of Findings– Your Mastertech inspector will develop a detailed, easy-to-read report that outlines what the inspector did, what he/she found, and what to do next. If deemed necessary, your inspector will present you with a detailed scope of work for a safe and effective attic mold removal. Our trained and certified attic mold removal professionals at Mastertech Environmental are thoroughly trained and equipped with the necessary knowledge, skills, and tools to safely address your attic mold removal needs. The Mastertech of Tidewater Team is dedicated to providing the safest, most effective and most efficient attic mold removal possible the first time. Every attic mold removal is backed by a 5-year, mold-free warranty. Our commitment to our high-quality standards is how we ensure our clients’ safety and that the job is done correctly. Call 1-757-932-2772 today to ask about attic mold removal services in your area of the Tidewater Region of Virginia. We will be happy to answer all your questions and schedule you for an appointment with one of our licensed and certified mold inspectors. Our team at Mastertech Environmental of Tidewater services all the following areas in the Tidewater Region of Virginia.